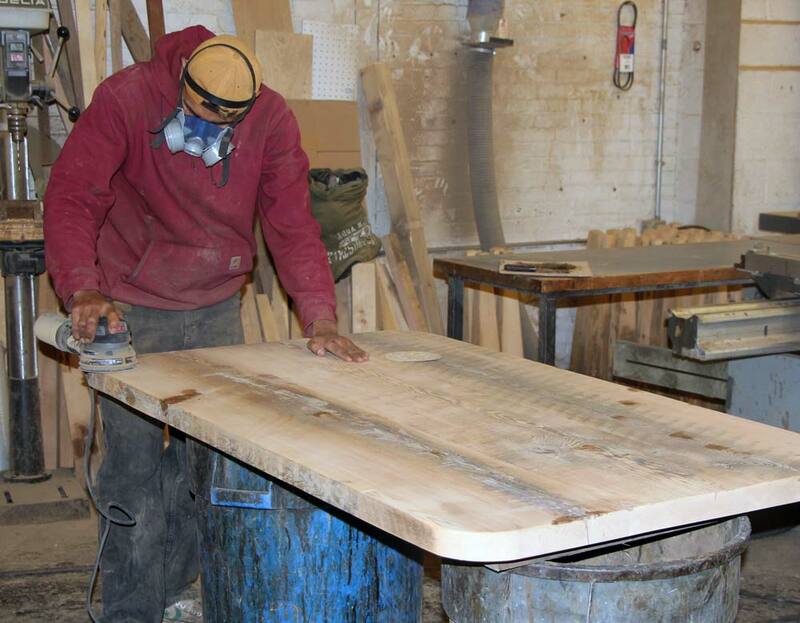 Curious about our table making process? Well, we’ve finally decided to spill the beans and give you a detailed account of how our handcrafted tables get from point A (the scrap heap) to point Z (your dining room). Are you ready to have your mind blown? 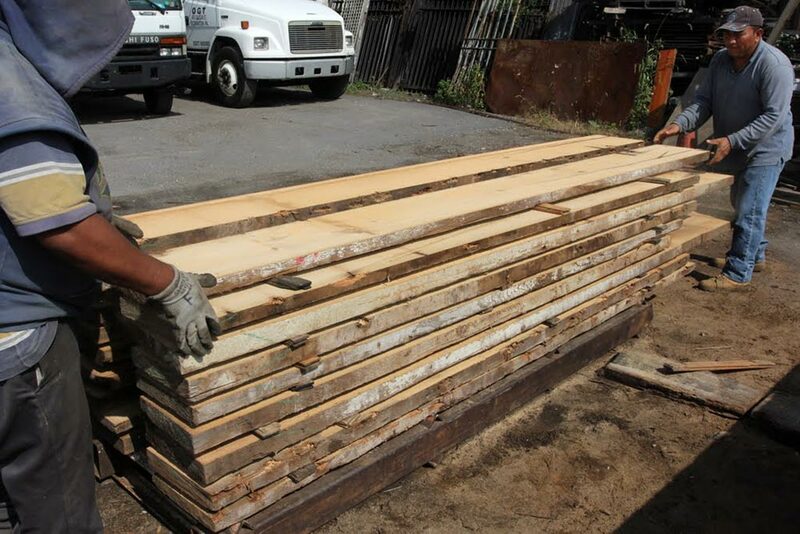 ■ Our tables begin as planks of wood salvaged from building that have been standing for 100 years. These buildings include historic brownstones and commercial buildings in New York City. Because the buildings are being demolished, we are saving wood from the landfill. We look for wood that is the right size and species for our tables. 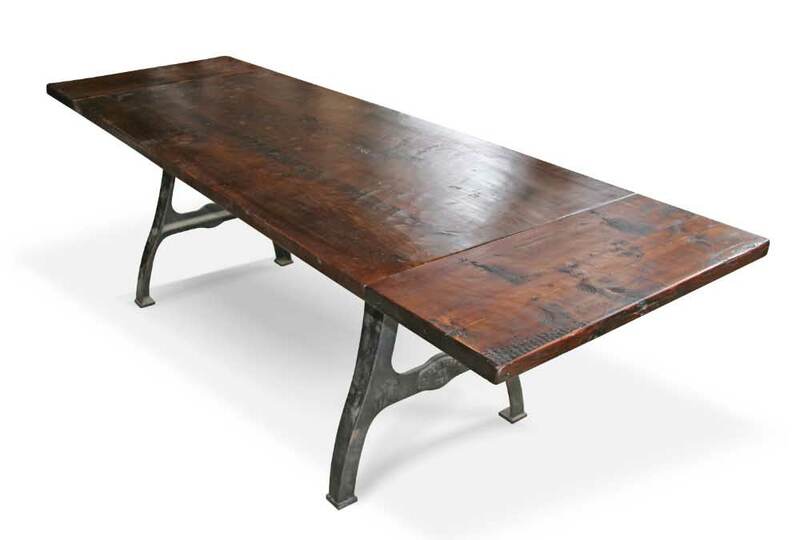 ■ We are picky about what goes into our tables so we select only the best beams and joists. The salvaged wood is actually higher quality than the wood used for making typical tables today. Even with its age, this wood will look better and last longer than anything on the market. ■ We prefer to use old growth North American salvaged wood, which means that a number of the joists and beams we select were hewn from trees that were growing in old forests in the 1700s. ■ Once we’ve selected the perfect pieces, we send them to our Scranton warehouse which happens to be the largest warehouse housing salvaged architectural materials in the US. ■ We remove any nails in the wood using a non-invasive magnetic nail finder. We reuse these old 1800s cut nails in projects for our designers and remodelers. 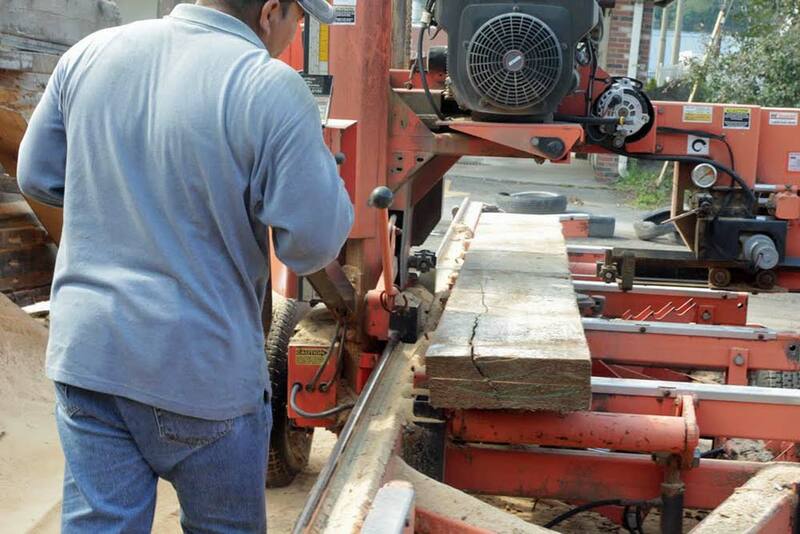 ■ If needed, we will cut the beams and joists down to a rough size using our handy dandy portable saw mill. ■ Once cut, we kiln dry the wood to remove any access moisture that may cause the wood to warp. ■ After drying, we fine cut the interior edges of the wood chosen as the top of the table. We use a special saw that allows the edges to be as straight as possible. This will ensure that the table joints fit perfectly. We will often use biscuit joints and glue to make the top the right size. The wood is clamped together until the glue dries in order to guarantee that the top will never split at the joints. ■ Once the glue has dried, we will send the table top through a planer that is wide enough to plane the whole table top at once, which means that the table top will be level and that dinner service won’t roll to one side or the other once placed. Also, the wide planing allows us to preserve as much of the original characteristics of the wood as possible. ■ The table legs and the skirt are made from the same salvaged wood, unlike our competitors who use new wood because it is easier to work with. ■ We create the table skirt and attach it so that it is ‘floating’. This allows it to shrink and expand with the humidity on any given day minimizing splitting and warping. ■ At this stage, we ask our clients for input regarding the type of finish they would like for their table. Typically, we will apply five coats of finish by hand using a marine spar varnish and tung oil mixture. We allow each coat to dry for at least eight hours before we sand the table smooth and apply another coat. 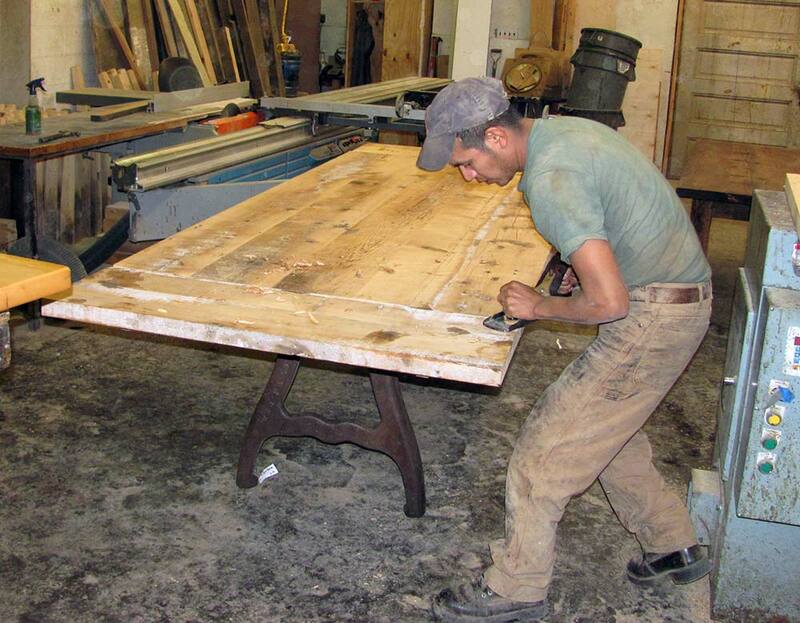 On average, it can take a week or more before we have completed applying the finish to our handcrafted tables. Our method of hand applying the finish provides our tables with a depth and richness that a spray booth cannot provide. Now that you know more about how our handcrafted tables are made, you are probably chomping at the bit to check out our growing selection. Or, if you’d like to know more about how to design your own handcrafted table, call in and speak with one of our craftsman. Because we make the tables ourselves, we are able to design and fashion a table based on your tastes and needs. Customized tables are one of our most popular furniture items. With our customized tables you can choose your length, height, width, and style. You can also choose the shape of the table; rectangle, square, round or oval are among your choices. Also, if you’d like your table to house a drawer or extend for more guests, we can add that detail for you. Your customization even includes your choice of table legs. You can choose from the standard wooden table legs fashioned from the same or different type of wood, of you can go with a more modern metal table leg. When it comes to textures, you can choose from rustic, semi-rustic, smooth or somewhere in-between. Our customized tables are in demand because our craftsmanship is excellent and our materials are only the highest quality. If you’d like to know more about how our tables are made, or if you’d like to stop by one of our locations to see one of our handcrafted tables for yourself, contact us or stop by for a visit.